Melanoma is a very aggressive form of skin cancer where advanced stages are generally associated with poor patient survival . Together with lung cancer, melanoma is characterized by the highest number of somatic mutations, mostly due to the exposure to environmental mutagens such as tobacco smoke or UV rays, respectively . Mutations in the Ser/Thr-kinase BRAF (especially the V600E mutation) are responsible for abnormal MAPK pathway signaling in more than 50% of melanoma patients. The development of a targeted therapy against this constitutively active BRAF has revolutionized the treatment of late-stage melanoma patients. In 2011, two BRAF inhibitors (Vemurafenib and Dabrafenib) were approved by the Food and Drug Administration for clinical use in late-stage patients [3, 4]. However, the emergence of rapid drug resistance in most patients challenges the overall positive response rates for these inhibitors. Therefore, a combination therapy targeting BRAF together with MEK, a downstream kinase in the same signaling pathway (by using Trametinib or Cobimetinib) was approved in 2015 for stage III and IV melanoma patients  increasing the overall survival from approximatively 15 months for single treatments to 25 months and delaying the onset of drug resistance [6, 7]. Nevertheless, drug resistance also occurs after combined BRAF/MEK inhibition causing unresolved clinical issues. A number of mechanisms conferring kinase inhibitor resistance have been described , many of which converge on a process termed “phenotype switching”, whereby melanoma cells escape inhibition by reversibly adapting proliferation rates, by metabolic re-wiring, and by differentiation/de-differentiation processes. Recently, immunotherapy with immune checkpoint inhibitors has become a promising 2nd line treatment for resistant patients or a 1st line treatment for BRAF wild-type (wt) patients, however, response rates are not exceeding 30% and treatment can be accompanied by severe side effects [9, 10]. Melanoma are very heterogeneous tumors [11, 12] and individual cells can gain additional mutations when evolving from primary lesions to metastasis or when subjected to therapy, which can be a major limitation to durable therapeutic responses. Therefore, the identification of novel drugs or drug combinations to delay or completely abolish the onset of resistance by targeting alternative pathways, proteins involved in cell cycle progression or the DNA damage response (DDR) pathway [13, 14], remains a clinically very important task and a number of new drugs are currently in clinical trials (reviewed in ). Most intrinsic or acquired mutations (under treatment pressure) inevitably lead to the reactivation of the MAPK signaling pathway or activation of the PI3K/Akt pathways, all driving proliferation of cancer cells. As most signaling pathways involve kinases, we screened a kinase inhibitor library in parental melanoma cell lines alongside their corresponding Vemurafenib- and Dabrafenib-resistant sublines in order to identify new potential targets. We determined potent combinations of kinase inhibitors, which showed long-lasting synergistic effects in the treated cells. The melanoma cell line A375 was obtained from ATCC, IGR37 and IGR39 melanoma cells were purchased from DSMZ and 501Mel melanoma cells were acquired from Dr. Ruth Halaban (Dermatology department, Yale School of Medicine, USA). Primary BRAF mut melanoma M45 cells were freshly isolated from a patient muscle metastasis at the Dermatology department, Technical University Dresden in Germany. The chopped tumor was incubated in HBBS (w/o Ca2+ and Mg2+) containing 0.05% collagenase, 0.1% hyaluronidase, 1.25 U/ml dispase 20 mM HEPES, 100 g/ml gentamycin; 100 U/ml penicillin and 100 g/ml streptomycin, for 60 min at 37 °C. After centrifugation, cell pellets were washed in HBSS/20 mM HEPES and maintained in RPMI + 10% FCS. The use of patient material for biochemical analysis was approved by the ethics committee of the TU-Dresden (EK 65032013) and informed consent was obtained from the patient. 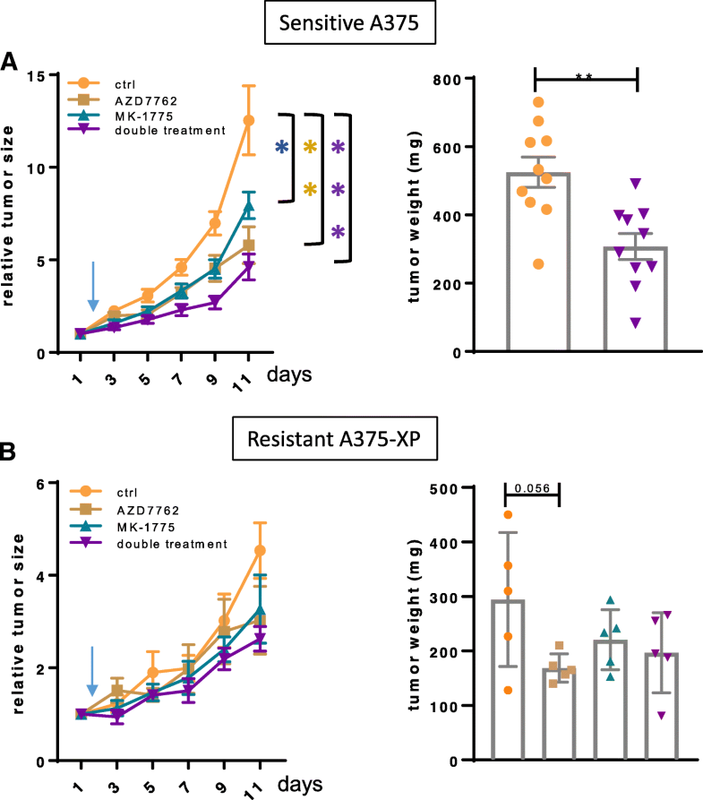 The drug-resistant counterparts of A375, IGR37 and 501Mel cells (-XP: Vemurafenib (PLX4032)-resistant, -GP: Dabrafenib (GSK2118436)-resistant) were produced as described before : Drug-resistant melanoma cell pools were generated from parental A375, IGR37, and 501Mel cells by long-term culturing under continuous presence of 5 μM Vemurafenib (PLX4032) or 100 nM Dabrafenib (GSK2118436). Inhibitor-containing media were exchanged three times a week. The parental A375 and resistant -XP and -GP derivatives were stably transduced with the near-infrared fluorescent protein (iRFP) using the LV-iRFP-P2A-Puro lentiviral particles (Imanis Life Sciences) as described in . All cells were maintained in RPMI-1640 containing GlutaMAX™ (GIBCO) and supplemented with 10% FCS (GIBCO), 50 μg/ml penicillin (LONZA) and 100 μg/ml streptomycin (LONZA). The BRAFi-resistant cell lines and the iRFP-transduced cells were maintained under continuous presence of the inhibitor (Vemurafenib or Dabrafenib, Selleck Chemicals) and the selection antibiotic (Puromycin, Invivogen) respectively. Normal human epidermal melanocytes NHEM (PromoCell) were maintained in serum- and PMA-free MGM-M2 medium. Normal Human Dermal Fibroblasts, NHDF (PromoCell) were grown in DMEM containing GlutaMAX™ (GIBCO) and supplemented with 10% FCS (GIBCO), 50 μg/ml penicillin (LONZA) and 100 μg/ml streptomycin (LONZA). All cells were cultured in a humidified atmosphere with 5% CO2 supply and were regularly PCR-tested to be mycoplasma-negative. The kinase inhibitor library, composed of 274 compounds dissolved in DMSO in a stock concentration of 10 mM, was purchased from Selleck Chemicals (Houston, USA). A375, IGR37 and 501Mel parental and BRAFi-resistant cells were seeded at a density of 0.5 × 104 cells/well in 96-well black μclear plates (Greiner) in the presence of 1 or 10 μM inhibitor. After 72 h of treatment, cell viability was assessed using the PrestoBlue Cell Viability Reagent (ThermoFisher Scientific). Measurements were performed with the CLARIOstar Monochromator microplate reader (BMG Labtech). All inhibitors used in this study were purchased from Selleck Chemicals (Houston, USA). They were dissolved in DMSO to a stock concentration of 10 mM according to the manufacturer’s instructions and stored at − 80 °C. Briefly, A375, IGR37 and 501Mel parental and their BRAFi-resistant -XP and-GP derivatives were seeded at a density of 0.5 × 104 cells/well in 96-well black μclear plates (Greiner). Eight different dilutions (in a 3-fold dilution series) of each inhibitor (ranging from 0.05 to 10,000 nM) were assayed in technical triplicates for 72 h in each experiment. Cell viability was measured with the PrestoBlue Cell Viability Reagent (ThermoFisher Scientific) on a CLARIOstar Monochromator microplate reader (BMG Labtech). Using the GraphPad Prism v5.04 software, the half-maximal inhibitor concentration values (IC50) were determined from the curve using the nonlinear log (inhibitor) vs response-variable slope (four parameters) equation. IC50 values were only determined for compounds which inhibited growth by more than 50%. In addition, the IC50 values were only considered if the software gave unambiguous results and the R2 value was above 0.92. The IC50’s were determined for 3 biological replicates and are listed with their standard deviations. The Chou-Talalay method  to determine possible synergistic effects of selected kinase inhibitor combinations was used as described in . A375, IGR37 and 501Mel parental and BRAFi-resistant cells were seeded at a density of 0.5 × 104 cells/well in 96-well black μclear plates (Greiner). Cells were treated with either single inhibitors or combinations thereof at indicated amounts in technical triplicates. The amounts were pre-determined from each inhibitor’s IC50 value and inhibitors were assayed in a defined dilution series and at constant ratio when combined. Cell viability was measured after 72 h of treatment, with the PrestoBlue Cell Viability Reagent (ThermoFisher Scientific) on a CLARIOstar reader (BMG Labtech). Combination Index (CI) values showing either synergy (< 1) or antagonism (> 1) were calculated with the CompuSyn software (ComboSyn, Inc). A375 parental and the BRAFi-resistant -XP and-GP derivatives were seeded at a density of 0.5 × 104 cells/well in 96-well black μclear plates (Greiner) and were further treated as described above. Synergy scoring was determined using the “inhibition readout” (calculated as “100 - Cell Viability”) on the online SynergyFinder software (https://synergyfinder.fimm.fi)  and implementing the ZIP calculation method . Apoptosis assays were performed by monitoring the caspase-3 activity through cleavage of the Ac-DEVD-AFC peptide (AlfaAesar) and the release of fluorogenic AFC (= 7-Amino-4-trifluoromethylcoumarin) in solution. Briefly, A375 parental and BRAFi-resistant cells were seeded at a density of 0.5 × 104 cells/well in 96-well black μclear plates (Greiner). Cells were left untreated or were treated with 200 μM Etoposide (Sigma-Aldrich), used as a positive control of apoptosis, or MK-1775 and AZD7762 inhibitors either single or in combination at the indicated amounts and in technical triplicates. After 24 h of inhibitor treatment, cells were lysed for 30 min at 37 °C with 3x ReLy Buffer (150 mM Tris (pH 7.4), 300 mM NaCl, 30% glycerol, 1% Triton-X, 0.3% CHAPS, 6 mM EDTA (pH 8.0), 6 mM DTT, 75 μM Ac-DEVD-AFC) and free AFC was quantified on a CLARIOstar reader (BMG Labtech). To ensure specificity of the assay, caspase-3 mediated cleavage of the Ac-DEVD-AFC peptide was in parallel blocked by addition of the potent Ac-DEVD-CHO caspase-3 inhibitor (AlfaAesar) at a concentration of 25 μM. Statistical significance was determined with one-way repeated measures ANOVA followed by Dunnett’s post-test using the Graphpad Prism Software. A375 parental and BRAFi-resistant cells, virally transduced with the near-infrared fluorescent protein (iRFP) were seeded at a density of 2500 cells/well in a 24-well plate (Greiner) in at least technical triplicates. Inhibitors, single or in combination, were added at the indicated amounts and replenished every 72 h for a duration of 76 days. To assess whether any remaining cells have become resistant to the treatment and would re-emerge, the drugs were removed and the cells underwent “drug holidays” for an additional 21 days. During the long-term treatment, cell proliferation was monitored bi-weekly on a LI-COR Odyssey Infrared Imaging System (LI-COR Biosciences). Fluorescence intensity was quantified with the Image Studio™ Lite software (LI-COR Biosciences). Cells were seeded at a density of 105 cells/well in 24-well plates (Greiner). 24 h post seeding, cells were treated with inhibitors at indicated amounts for 3 h and/or 24 h. Western blot analysis was performed as described before . The following primary antibodies were used: anti-phospho-CHK1 (Ser317) (Cell Signalling Technology, 1:1000), anti-CHK1 (Cell Signalling Technology, 1:1000), anti-phospho-cdc2 (Tyr15) (Cell Signalling Technology, 1:1000), anti-cdc2 (Cell Signalling Technology, 1:1000), anti-PARP (Cell Signalling Technology, 1:1000), anti-cleaved-PARP (Cell Signalling Technology, 1:1000), anti-phospho-Erk (Tyr202/Tyr204) (Cell Signalling Technology, 1:2000), anti-Erk1/2 (Santa Cruz, Erk1 = 1:1000, Erk2 = 1:2000), anti-phospho-Akt (Ser473) (Cell Signalling Technology, 1:1500), anti-Akt1/2 (Santa Cruz, 1:1000), anti-Vinculin (Abcam, 1:1000) and anti-Tubulin (Santa Cruz, 1:5000). HRP-labeled secondary antibodies were purchased from Cell Signaling Technology (Boston, MA). NOD scid gamma (NSG) mice were bred in-house and experiments were performed according to all applicable laws and regulations, after receiving approval by the institution’s animal experimentation ethics committee and the veterinarian service of the Ministry of Agriculture (Permit Number: 18-MDM-01). Single parental sensitive A375 cells (0.5 × 106 cells) and Vemurafenib-resistant A375-XP cells (2 × 106 cells) were resuspended in 100 μL of 1:1 mixed serum-free medium and matrigel (BD Biosciences) and injected subcutaneously in 6–8 week-old mice. At day 14, mice (n = 10 mice/group for A375 cells and n = 5 mice/group for A375-XP cells) had tumors with volumes of approximately 150mm3. Daily treatment was started for 8 consecutive days with vehicle, 40 mg/kg MK-1775 (formulated in 0.5% methylcellulose) given by oral gavage, 25 mg/kg AZD7762 (formulated in 11.3% 2-hydroxypropyl-β-cyclodextrin in 0.9% sterile saline) given by daily intraperitoneal injection, or the combination of MK-1775 and AZD7762. Control mice received the respective vehicle by oral gavage and intraperitoneal injection. Tumor growth was followed and tumor volumes were calculated by the formula 0.5236 × length × width × height. Statistical analysis was done using a two-way ANOVA followed by post-hoc Tukey’s multiple comparison tests. 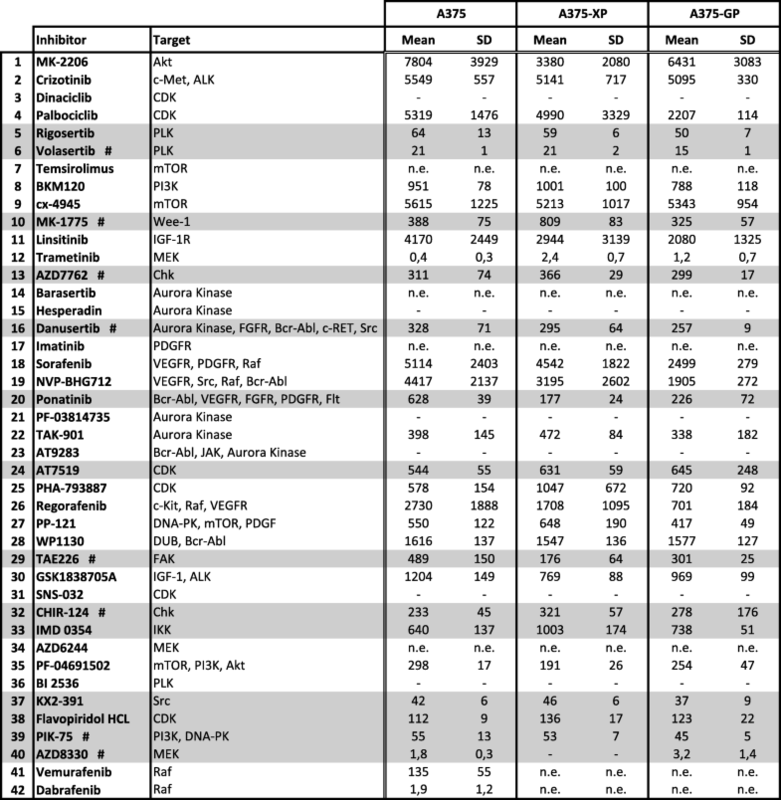 In order to identify new kinases that could act as potential therapeutic targets to overcome BRAF inhibitor resistance, we screened a kinase inhibitor library of 274 compounds in 3 different melanoma cell lines that carry a mutated BRAF gene and are wild-type for NRAS: A375 cells with homozygous BRAF V600E and IGR37 and 501Mel cells heterozygous for BRAF V600E. All 3 cell lines were sensitive to the BRAF inhibitors Vemurafenib and Dabrafenib (Table 1 and ). Matching cells resistant to these 2 BRAF inhibitors had previously been generated and characterized in our lab . The parental and 2 corresponding BRAFi-resistant cell lines were incubated for 72 h with 2 different concentrations (1 and 10 μM) of the individual drugs and cell viability was assessed (Additional file 1: Table S1). For further testing, we chose 40 inhibitors that either (i) had effects at low (1 μM) concentrations (e.g. Dinaciclib (CDKi), PIK-75 (PI3Ki, DNA-PKi), Trametinib (MEKi)), (ii) showed differences between parental and resistant cells (e.g. NVP-BHG712 (VEGFRi, Srci, Rafi, Bcr-Abli), Temsirolimus (mTORi), Sorafenib (VEGFRi, PDGFRi, Rafi)), (iii) had been described in literature to affect melanoma cells (e.g. MK-1775 (Wee1i), AZD7762 (Chki), Danusertib (AURKi, FGFRi, Bcr-Abli, c-RETi, Srci)) or iv) had comparable effects in at least 2 of the 3 different cell lines (e.g. ON-01910/Rigosertib (Plki), KX2–391 (Srci)). An overview of the study design and the selection of compounds for next round evaluations and combinatorial testing in short- and long-term experiments are shown in Fig. 1 and Table 1 respectively. To validate the effects of the 40 selected inhibitors, we generated dose-response curves by assessing cell viability and calculating IC50 values for A375 cells: parental and 2 corresponding resistant derivatives (labeled -XP when resistant to Vemurafenib and -GP when resistant to Dabrafenib ) (Additional files 2 and 3: Figure S1 and Table 1). To consolidate the data obtained in A375 cells, we further tested 20 of the chosen inhibitors in IGR37 and 501Mel cells (Fig. 3a and Additional file 4: Figure S2). From these results, 14 inhibitors were selected based on their reproducibility, potency, and the quality of the curves obtained: we chose drugs that either potently inhibited proliferation in all 3 cell lines (Rigosertib, MK-1775, AZD7762) or that targeted pathways not directly linked to the MAPK pathway (IMD 0354 targeting IKK, or PIK-75 targeting PI3K and DNA-PK). Only drugs that presented acceptable dose response curves with IC50 values well below 1 μM were further analyzed. Overall, 8 inhibitors of kinases involved in cell cycle regulation (targeting cyclin-dependent kinases (CDKs), Aurora kinases (Aurks), Polo-like kinases (Plks), checkpoint kinases (Chks)), along with 6 inhibitors targeting different signaling pathways (see compounds marked in grey in Table 1) showed best results. Six of the 14 selected inhibitors (Rigosertib, Flavopiridol HCl, AT7519, KX2–391, IMD0354 and Ponatinib) did not act synergistically with the BRAF inhibitors (data not shown). 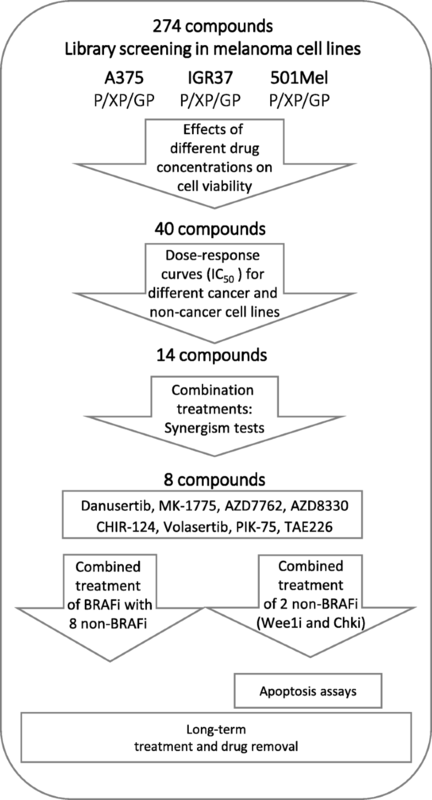 For the remaining 8 compounds, synergistic effects with the BRAF inhibitors Vemurafenib and/or Dabrafenib were scored in A375 cells (Fig. 2a and Additional file 5: Figure S3). Synergism can be calculated with different methods using effect-based strategies, like the Bliss independence or the HSA (Highest Single Agent) model or by dose-effect-based strategies, like the Loewe additivity model . Here we applied 2 different tools to assess synergy: the Chou-Talalay method based on Loewe additivity  and Synergyfinder, scoring synergism using the 4 main models, HSA, Loewe, BLISS and ZIP (Zero Interaction Potency) . When the BRAF inhibitors Vemurafenib and Dabrafenib were combined with drugs targeting the cell cycle like MK-1775 (Wee1i), AZD7762 (Chki) and Danusertib (Aurki), clear synergistic effects were observed as indicated by CI (combination index) values < 1 calculated by the Chou-Talalay method (Fig. 2a). CI values > 1 (marked in red) illustrate antagonism, as seen for the lowest concentrations of MK-1775 and AZD7762. As expected, the combination of BRAF and the MEK inhibitor AZD8330 also showed synergistic effects at low concentrations (Fig. 2a, lower 2 panels). Further combinations of inhibitors with synergistic effects are shown in Additional file 5: Figure S3A. Interestingly CHIR-124 (Chki), Volasertib (Plki) and PIK-75 (PI3Ki) had synergistic effects only with Dabrafenib. Vemurafenib showed synergism when combined with TAE226 (FAKi). Additional file 5: Figure S3B confirms the synergistic combinations observed with the Chou-Talalay method, using Synergyfinder, another tool for drug combination analysis: red regions with synergy scores > 1 indicate synergism (the regions of highest synergy are marked by a white frame), whereas the green regions indicate antagonism. Concentrations of drugs determining the regions of highest synergy were generally in the lower ranges, further strengthening their role as potential drug combination partners. To confirm the inhibition of Wee1 kinase by MK-1775, Tyr15 phosphorylation levels of CDK1 (P-cdc2) were tested  while specificity of the Chk1 inhibitor AZD7762 was assessed by measuring induced phosphorylation of Chk1 [25, 26] (Additional file 6: Figure S4a). Both inhibitors performed with the expected level of specificity. The inhibition of Erk phosphorylation by Vemurafenib was confirmed as observed before  and the FAKi TAE226 worked by blocking P-Akt levels as expected . Taken together, we identified 8 kinase inhibitors which had synergistic effects on cell growth when combined with Vemurafenib and/or Dabrafenib. The combination of Wee1 and Chk inhibitors both targeting key enzymes of cell cycle control can kill melanoma cells independent of their BRAF mutation status [28, 29]. Here, both types of cell cycle inhibitors (AZD7762 and CHIR-124 (Chki) and MK-1775 (Wee1i)) acted synergistically with the BRAF inhibitors (Fig. 2a, Additional file 5: Figure S3B). Therefore, we investigated whether a combination of these drugs would also be effective in BRAF inhibitor-resistant cells, as this would be of high clinical relevance. Indeed, when the Wee1 inhibitor MK-1775 was combined with the Chk inhibitors AZD7762 or CHIR-124, highly synergistic effects were scored at the concentrations tested (Fig. 2b) both for the sensitive but importantly also for the BRAFi-resistant A375 cells (-XP: resistant to Vemurafenib, -GP: resistant to Dabrafenib). The same results were obtained with Chou-Talalay analysis, which indicated very low CI values (Additional file 7: Figure S5A), and only at the lowest concentrations CHIR-124 and MK-1775 lost their synergistic effects. 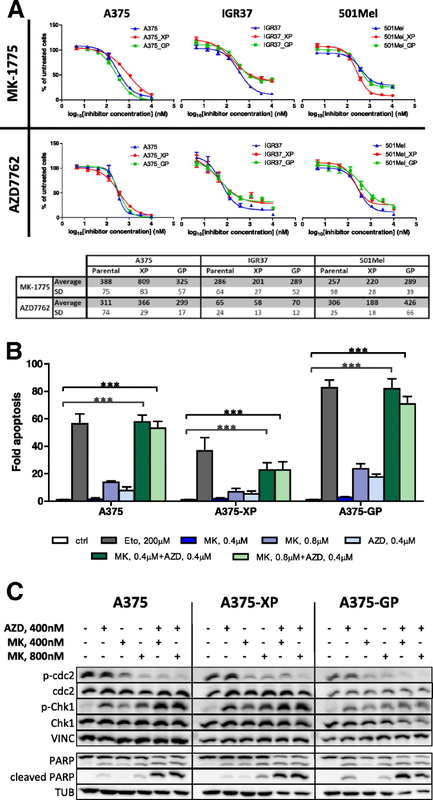 MK-1775-driven Wee1 inhibition in parental and resistant A375 cells reduced levels of inhibitory CDK1 (cdc2) phosphorylation, and this effect was enhanced by the Chki AZD7762 (Fig. 3c). Vice versa, when cells were treated with AZD7762, we observed increased levels of inhibitory Ser317 phosphorylation in Chk1, which were even more pronounced when Wee1 was inhibited in parallel (Fig. 3c). Similar effects were also observed in primary melanoma cells derived from a patient’s muscle metastasis (M45) (Additional file 6: Figure S4C). To further consolidate these observations, the same treatments (MK-1775 combined with AZD7762) were applied to 2 additional melanoma cell lines, both sensitive and resistant to BRAF inhibitors, namely IGR37 and 501Mel, with identical results (Fig. 3a, Additional file 7: Figure S5B). An intrinsically resistant cell line to BRAFi, IGR39, was also tested and again we observed synergistic killing effects of the MK-1775/AZD7762 combination (Additional file 7: Figure S5C). Next, we investigated if the combination of Wee1 and Chk inhibitors induces apoptosis rather than slowing down proliferation of parental and resistant A375 cells and of the primary M45 melanoma cells (Fig. 3b and c, Additional file 6: Figure S4). While single treatments with 400 or 800 nM Wee1 inhibitor (MK-1775) and 400 nM Chk inhibitor (AZD7762) (blue bars) increased apoptosis rates (measured by caspase-3 activity) up to only 20%, the combined application of both drugs (green bars) induced very high apoptosis levels similar to the Etoposide treatment (positive control) in parental and Dabrafenib-resistant cells, with less pronounced responses in Vemurafenib-resistant cells (Fig. 3b). Increasing the concentration of MK-1775 (800 nM) in the combination treatment did not enhance the effect further (light green bars). In general, A375 cells resistant to Dabrafenib (A375-GP) were more sensitive to apoptosis induction, either by the control treatment (Etoposide) or by the kinase inhibitors. Comparable results could also be detected in the M45 primary cells (Additional file 6: Figure S4B). 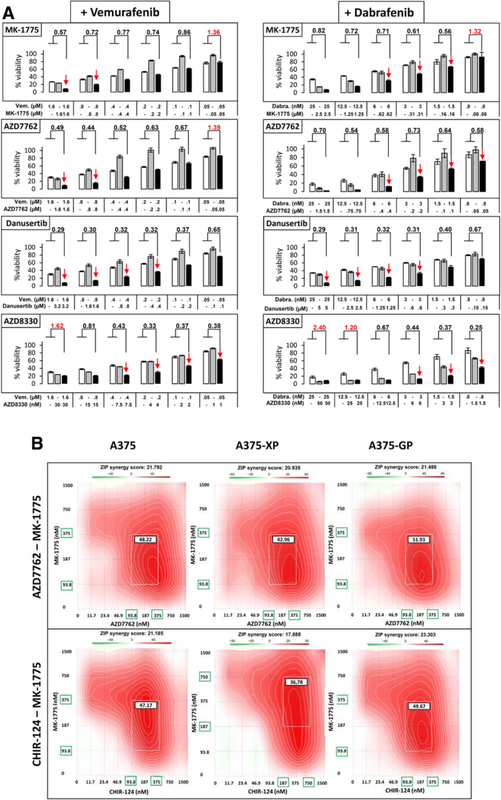 Cleavage of PARP, another indicator for apoptosis, was also induced by treatment with either AZD7762, MK-1775 and even more so with their combination (Fig. 3c, Additional file 6: Figure S4C). Moreover, we tested the effects of candidate drugs on normal/healthy cells present in and around the tumor, namely melanocytes (NHEM) and fibroblasts (NHDF). As expected, the very specific BRAF inhibitors Vemurafenib and Dabrafenib did not have any effect on the healthy counterpart cells, alone or in combination with the different other inhibitors (Fig. 4 and Additional file 8: Figure S6). The Wee1 inhibitor MK-1775 and the Chki AZD7762 had very modest effects on healthy fibroblasts and melanocytes at lower concentrations, which is in line with results observed by Magnussen and colleagues . When both drugs were combined, we observed nearly no caspase-3 activation and no PARP cleavage at all (Additional file 6: Figure S4). The beneficial effects of combining Chk and Wee1 inhibitors have been demonstrated in BRAF mutant and wild-type melanoma cells, as well as in other human tumor cell lines [28, 29, 31, 32]. Here, we confirm these observations and additionally, our study highlights the efficacy of this combination especially on melanoma cells rather than healthy surrounding cells, and also importantly in the context of acquired and intrinsic BRAF inhibitor resistance. To assess the effect of Wee1 and Chk inhibition in vivo, we tested MK-1775, AZD7762 and the combination of both in mice injected subcutaneously with parental sensitive A375 cells or Vemurafenib-resistant A375-XP cells (Fig. 5). The combined inhibition of Wee1 and Chk stopped tumor growth in resistant and even more so in sensitive tumors, supporting the clinical relevance of our findings. Additionally, mice did not lose weight nor did they show any obvious side effects during treatment, altogether indicating no major toxicity issues. As patients are generally treated over longer periods of time, long-term in vitro studies are necessary to finally conclude on drug effects. The often used 48-72 h assays are not adequate to exclude that resistance will eventually occur, even with a combination of drugs that are synergistic using the above shown conditions. Based on the promising synergistic effects (Fig. 2, Additional file 5: Figure S3 and Additional file 7: Figure S5), the following 8 kinase inhibitors were selected for further characterization in long-term experiments: Danusertib (Aurora kinase, FGFR, Bcr-Abl, c-RET, Src inhibitor), MK-1775 (Wee1i), AZD7762 (Chki), CHIR-124 (Chki), Volasertib (Plki), PIK-75 (PI3K, DNA-PK inhibitor) and TAE226 (FAKi) (see Table 1, marked in grey with #). We generated parental and resistant A375 cells stably expressing iRFP (near-infrared fluorescent protein) to be able to monitor effects of the inhibitors over time. iRFP fluorescence was quantified on a LICOR imaging system, allowing for continuous proliferation measurements following single kinase inhibitor or combined treatments. After 11 weeks in the presence of drugs, cells were fed for another 3 weeks with regular medium, in order to evaluate if combination treatments had killed all cells or if residual melanoma cells would resume their growth once the drugs were removed. In a first set of treatments, different kinase inhibitors were combined with Dabrafenib or Vemurafenib (data not shown) in parental A375 cells. Figure 6a clearly indicates that until day 76 (11 weeks, after this timepoint the drugs were removed) a combination of Dabrafenib with AZD7762 (Chki) or MK-1775 (Wee1i) was able to stop cell growth. As expected, cells had become resistant to the single treatments and continued to proliferate, except in presence of 300 nM CHIR-124 (another Chki) which killed most of the cells, opposed to 150 nM of this drug, which was not sufficient to prevent cells to grow back even in the presence of both drugs (with Dabrafenib, data not shown). This highlights the importance of treatment with adequate drug concentrations for prevention of tumor recurrence. PIK-75 together with Dabrafenib was also efficient in suppressing growth over extended periods of time, as compared to the single treatments. Regarding Danusertib, the results were inconsistent, with only 1 out of 3 wells showing resistant cells in the single treatment. A concentration of 40 nM Volasertib (Plki) (and also 20 nM, data not shown) killed all cells. Notably, removal of most drugs from the cell medium after day 76 (marked by the red arrow) allowed for remaining cells to grow back even in the combined treatments. By day 97 (after 20 days without drugs) cells had re-grown for most treatments. The combined inhibition of BRAF and Plk (by Volasertib) marked an exception where hardly any surviving cells were detected at day 97, while cells treated with Volasertib alone had started to grow back. Identical results were obtained with 20 nM Volasertib (data not shown). Taken together, treatments combining BRAF inhibition with Chk (AZD7762, CHIR-124), Wee1 (MK-1775) or Plk (Volasertib) inhibition led to a more efficient response than with single treatments, although cells partially re-grew after removal of the drugs. Overall, these findings suggest that such combined treatments with optimized concentrations and treatment duration could have more durable clinical effects for advanced-stage melanoma patients. Ultimately, ideal concentrations and durations of single or combined drugs and their treatments have to be established in clinical trials. Finally, we combined the most promising Chk and Wee1 inhibitors AZD7762 and MK-1775, since they showed high degrees of synergism in parental but also in several BRAF inhibitor-resistant melanoma cell lines, over longer periods of time. 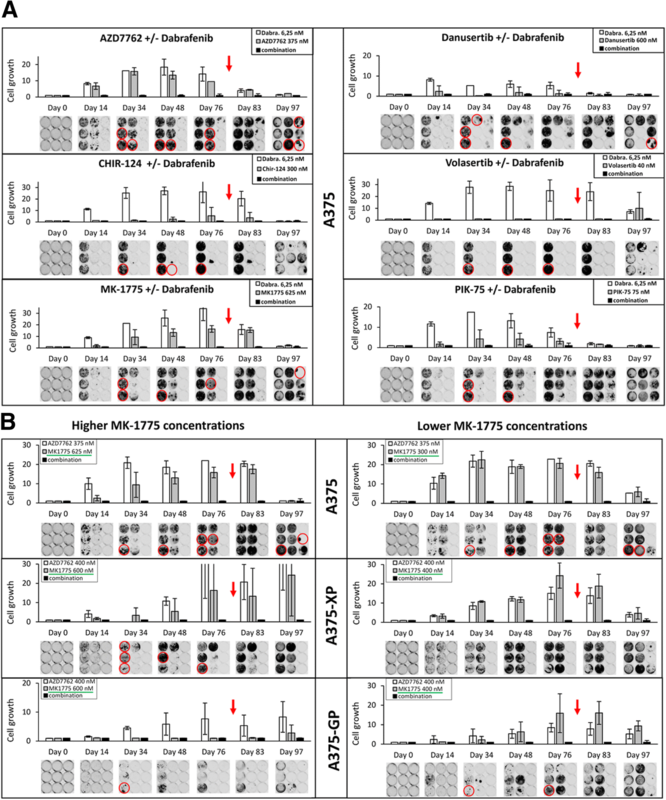 In parental A375 cells, a clear advantage of combinations, with no cell growth visible until day76 (with low and higher concentrations of MK-1775, Fig. 6b) was observed. After removal of drugs, at least 1 out of 3 wells of parental A375 cells showed few surviving cells. Interestingly, cells resistant against either Vemurafenib or Dabrafenib, reacted differently to secondary drugs under short- and long-term exposure (Figs. 3 and 6). These findings argue for personalized 2nd line treatments, which may vary depending on the administered 1st line drug. Furthermore, long-term experiments illustrate that drugs (even in combination) that seem to act synergistically in 72 h assays can still induce resistance over longer exposure times, making them less likely to work in patients where drugs are usually administered over many months. Additionally, we could show that the combination of the Chk and Wee1 inhibitors is promising when treating parental, but also BRAF inhibitor resistant cells. Even though melanoma has been the posterchild when it comes to advances in cancer treatment over the last few years, there is still a long way to go until a larger percentage of advanced stage patients can expect a much prolonged progression-free survival (PFS) or even to be cured. Largely, melanoma patients fall into 2 groups: BRAF wt and BRAF mutant, for which efficient targeted therapies exist. Combined BRAF and MEK inhibition have increased median PFS to 9–11 months , but could have much better clinical outcomes if it was not for the inevitable emergence of drug resistance. For BRAF wt (~ 50%) and also for drug-resistant patients, a new treatment option has become available in recent years: immunotherapy with PD-1 (Programmed cell death protein 1), PD-L1 (Programmed death-ligand 1) and CTLA4 (cytotoxic T-lymphocyte associated protein 4) immune checkpoint inhibitors. Kinases represent one of the largest groups of druggable proteins: the 518 kinases encoded within the human genome are involved in basically all signaling pathways and their functions are often aberrantly regulated not only in cancer but also in immunological, metabolic or degenerative disorders. As a consequence, many successful kinase inhibitors have been developed for the clinical treatment of several cancers and other diseases (e.g. Imatinib (Gleevec), Crizotinib, Tofacitinib, Ruxolitinib). Currently, 43 inhibitors have FDA approval (www.brimr.org/PKI/PKIs.htm) . The biggest part of these drugs are ATP competitive inhibitors, targeting the ATP pocket of the kinase either in its active (Type I inhibitors) or inactive (Type II inhibitors) state. Type III and IV inhibitors bind to pockets that are specific for each kinase, making them much more selective. To date, only 3 inhibitors (all of them MEK inhibitors: Trametinib, Cobimetinib and Binimetinib) are of the highly selective Type III (www.brimr.org/PKI/PKIs.htm) . The ATP-binding site is highly conserved among all kinases, and for this reason the so called “poly-pharmacology effect” (inhibitors targeting more than one protein) is often observed with Type I and II inhibitors. These off-target effects can have detrimental consequences (severe side effects of treatment) for patients, however they could also be exploited for drug repurposing. Recent studies have profiled kinase inhibitors across the kinome [33–36] to get further insights into their target specificity and potency, their kinase and non-kinase off-target effects . Aberrantly regulated CDKs (in melanoma 75 to 90% of tumors show mutations in the p16INK4A-cyclinD-CDK4/6-Rb pathway) (reviewed in ) allow for uncontrolled tumor growth overriding crucially important checkpoints, making these kinases very prominent drug targets. Many CDK inhibitors are currently in clinical trials for melanoma treatment [39, 40]. Aiming at checkpoint kinases like Chk1 or Wee1 that normally halt cell cycle progression to allow for DNA damage repair would prevent these arrests and drive cell proliferation, despite the accumulation of DNA damage, possibly leading to apoptosis during mitosis (“mitotic catastrophe”) . Replicative stress (RS), which is the interruption of replication fork progression and/or DNA synthesis during replication, can be induced by depletion of nucleotide pools, reactive oxygen species (ROS), oncogenic signaling and tumor suppressor inactivation, all present in melanoma cells. Considerable RS, an uncommon feature of normal cells, can lead to apoptotic and non-apoptotic cell death [13, 42]. RS is also a strong activator of Chk1 and Wee1, again making these checkpoint proteins interesting drug candidates. So far, the Wee1 inhibitor MK-1775 (AZD-1775) is being tested in clinical studies, alone and in combination with multiple other compounds. At present (July 2018) 50 studies for MK-1775 were recorded in ClinicalTrials.gov, only 1 of them including melanoma patients. Also several Chk1 inhibitors have been tested, among them AZD7762, that had to be discontinued due to high cardiac toxicity . Like anti-mitotic drugs (e.g. Taxol), the therapeutic targeting of the mitotic Polo-like (Plk) and Aurora kinases, overexpressed in many cancer types (reviewed in [14, 44]), can induce mitotic cell arrest and cell death. Volasertib and Rigosertib targeting Plk1 are 2 promising inhibitors inducing cell cycle arrest and apoptosis, which are in clinical trials for different cancer entities, except melanoma. Likewise, various inhibitors of the A and B members of the Aurora kinase family (e.g. Alisertib, Danusertib) are in clinical studies . One of the goals of our study was to find novel combination treatments with BRAF inhibitors that would act synergistically and could prevent or overcome resistance. We have identified several drugs that target the DNA damage checkpoint kinases Chk1/2 and Wee1 (namely AZD7762, CHIR-124 and MK-1775, respectively) and that work synergistically with BRAF inhibitors, as quantified through an effect based (Synergyfinder) and a dose-effect based (Chou-Talalay) methodology (Fig. 2a and Additional file 5: Figure S3). Interestingly, Wee1 kinase was identified as a downstream target of BRAF V600E  and its expression was found to be upregulated in melanoma as compared to benign nevi . This combined inhibition of mutated BRAF and Wee1 is a very good example of vertical pathway inhibition where 2 players within the same oncogenic pathway are targeted, making the treatment more efficacious and lowering the chances of resistance development. In our hands, even after 11 weeks of combined treatment with Dabrafenib and MK-1775, cells had not become resistant (Fig. 6a). A few surviving cells were able to grow back after the drugs had been removed from the medium, indicating the need for further adjustments of initial drug concentrations and duration of treatment. The same observations were made when BRAF inhibitors were combined with the Chk inhibitors AZD7762 and CHIR-124. Targeting the Aurora kinases A and B with Danusertib in combination with the BRAF inhibitors Vemurafenib and Dabrafenib synergistically killed A375 melanoma cells (Fig. 2a). This pan-Aurora kinase inhibitor also induced apoptosis and inhibited migration of several other melanoma cell lines . Volasertib, an inhibitor of the mitotic kinase Plk1, had strong synergistic effects with the BRAF inhibitor Dabrafenib (Additional file 5: Figure S3A). Long-term experiments showed that 40 nM of Volasertib on its own was enough to keep cells in check, but when inhibitors were removed from the medium after 11 weeks, only the combined treatment with Dabrafenib and Volasertib was able to prevent recurrence of cell growth. Volasertib (BI 6727) had been shown to delay growth of melanoma tumors and to cause regression by inducing apoptosis in vivo  and, importantly, it showed synergistic antitumor effects together with the MEK inhibitor Trametinib in NRAS mutant melanoma . This inhibitor has been studied extensively in over 25 clinical trials, but has not received FDA approval yet. Furthermore, we have also observed synergistic effects of horizontal inhibition of the cross-talking pathways, PI3K/Akt and MAPK (Additional file 5: Figure S3A). A draw-back of this strategy is the appearance of dose-limiting toxicities, but many combinations are currently tested in clinical trials (reviewed in ). Another interesting observation is the synergistic combination of Vemurafenib with the FAK inhibitor TAE226 (Additional file 5: Figure S3). FAK was recently described to be involved in the emergence of dedifferentiated, BRAFi-adapted cells and its inhibition increased killing effects of BRAF and MEK inhibitors . Using a computational approach, Gayvert and colleagues discovered a synergistic interaction between Vemurafenib and FAK inhibitor 14 . Very importantly, the tumor microenvironment, namely melanoma associated fibroblasts, were activated by BRAF inhibition inducing FAK-dependent melanoma survival and a combination of Vemurafenib with a FAK inhibitor lead to tumor regression in mouse allografts and patient-derived xenografts . Notably, all of the above-mentioned inhibitors that had synergistic effects with BRAF inhibitors also very efficiently (low IC50 values) killed BRAFi-resistant melanoma cells (A375, IGR37, 501Mel) on their own (See Table 1, Fig. 3a, Additional file 3: Figure S1 and Additional file 4: Figure S2). The combined inhibition of Wee1 and Chk1/2 has shown very promising effects when applied to other cancer cells but also melanoma cells (reviewed in ). Since we were interested in finding drug combinations that would also kill BRAFi-resistant melanoma cells, we extensively studied these drug pairs (AZD7762 (Chki) and MK-1775 (Wee1i) or CHIR124 (Chki) and MK-1775 (Wee1i)) in drug-naïve and -resistant melanoma cell lines (Figs. 2b, 5 and Additional file 7: Figure S5). We could clearly show that combined inhibition of Chk1/2 and Wee1 synergistically killed BRAFi-resistant cells and more importantly, reduced tumor growth by up to 50% in an in vivo melanoma mouse model. In long-term treatments over 11 weeks especially the BRAFi-resistant A375 cells (A375-XP and –GP) showed no or very little regrowth of cells when drugs were removed from the medium (Fig. 6b). These results indicate that the Wee1/Chk1/2 inhibition could be an encouraging therapeutic option for BRAFi-resistant melanoma patients. Until entirely new treatment regimens such as more efficient immunotherapies, combinatorial inhibition with drugs targeting histone deacetylases (HDACs) or inducing apoptosis (reviewed in ) or immunotherapies together with oncolytic viruses [53, 54] as well as personalized cocktails of combined treatments come into practice, more efficient combinations of available and FDA-approved kinase inhibitors could improve progression-free survival of melanoma patients, who are not eligible to BRAF inhibition or have become resistant to this treatment. For those patients (at least 50%) other kinase inhibitor combinations, either given as targeted therapy alone or before or after immunotherapy, could become the treatment of choice. Taken together, we have identified and characterized synergistic kinase inhibitor treatments targeting the MAPK pathway and the cell cycle that could be promising alternatives for drug-resistant melanoma patients or wild-type BRAF patients. Interestingly, different drug combinations were effective depending on which one of two standard BRAF inhibitors was used in 1st line therapy. Finally, we show that fine-tuned drug concentrations and optimized treatment durations are necessary to achieve long lasting effects without rapid emergence of resistance. This study was supported by a grant from the Fondation Cancer Luxembourg and by the University of Luxembourg IRP “ImMicroDyn” (13MD18). IK is funded by the PRIDE doctoral research program by Fond National de la Recherche (Luxembourg) in the scope of the Doctoral Teaching Unit – “CANBIO” PRIDE15/10675146/CANBIO. The funding bodies merely provided financial support. CM designed and performed the experiments, analyzed the data, prepared the figures and wrote the manuscript; DP designed and performed the experiments, generated iRFP-expressing cells and performed apoptosis assays and helped writing the manuscript; IK performed experiments; GC helped with experiments and to prepare the manuscript; PF and EL performed the in vivo studies; DK generated M45 primary melanoma cells, CH helped to conceive experiments, interpreted the data and performed editorial work; SK conceived, directed and supervised the study and wrote the manuscript. All authors read and approved the final manuscript. The use of patient material for the isolation of primary melanoma cells was approved by the ethics committee of the TU-Dresden (EK 65032013) and informed consent was obtained from the patient. For in vivo assays, the approval by the University of Luxembourg’s animal care and ethics committee was obtained (18-MDM-01) and experiments were performed according to applicable laws and regulations.